Identify the basic issues driving our planning – enrollment numbers, scholarship dollars, what are our major competitors, etc. In the period January - March 2015, the leadership team reviewed the previous Strategic Plan. There is a consensus that the new document should not be as all-encompassing. The need of mechanisms to evaluate its implementation throughout the period and update the strategy at least once in the middle of the period should be kept in mind. 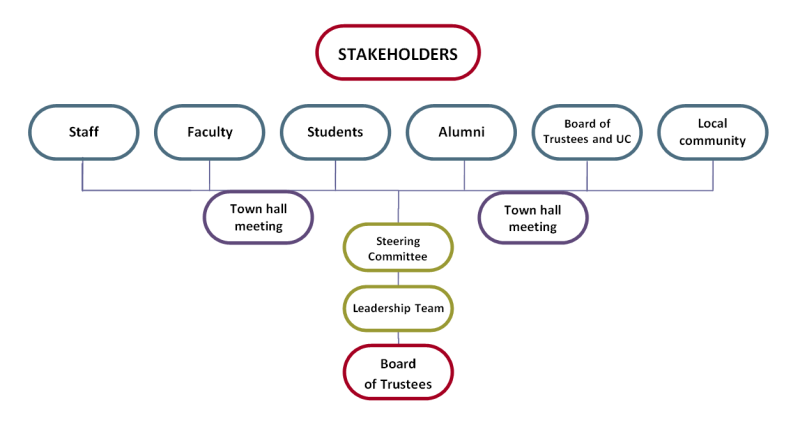 A Planning Committee consisting of staff and faculty members was formed to help structure the process. Three introductory discussion sessions with faculty and staff took place in April to talk about general directions and define basic expectations of the different stakeholder groups regarding the style of writing and scope of the project. At the meetings, President Aspegren elaborated on five general themes as his proposal for key areas to be covered by the next Strategic Plan: integration of values, academic excellence, development, admissions, and campus experience. During the sessions, the President gathered feedback from a large number of attendees, as well as invited feedback in writing by May 7. Department meetings to discuss accomplishments and needs already incur with the participation of the leadership team. The leadership team held dedicated meetings, as well, to evaluate some key strategic parameters.